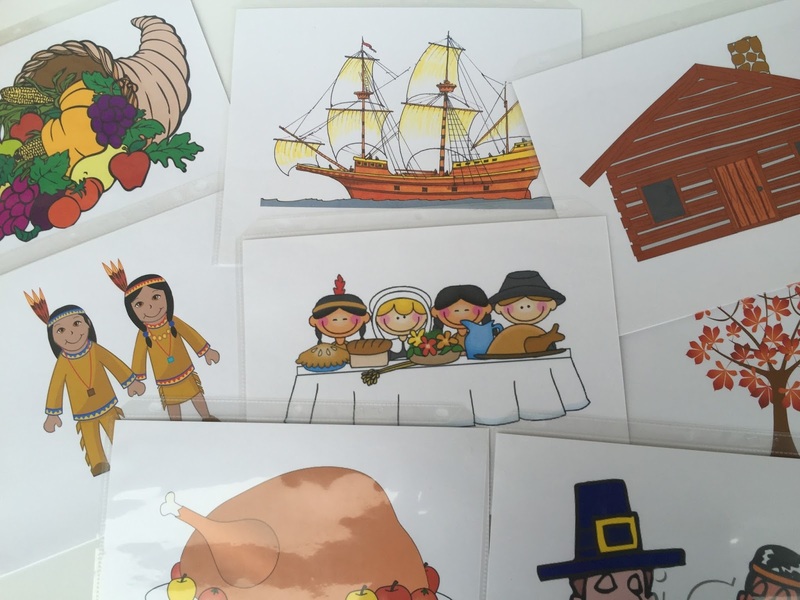 Download and print The First Thanksgiving book I made HERE. I printed the first page (the cover) on red card stock then all the rest on white card stock. I did add a blank red piece of card stock for the back cover as well but there's nothing to print for that ;). And so on. 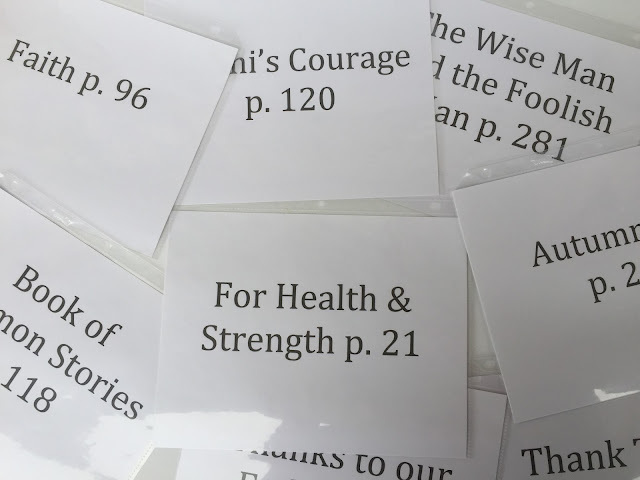 If you keep all the pages in order as they are printed, everything will fall into place where it should go. Then you'll also need 8 magnets and words to post for any unfamiliar songs. See how I post words to songs by clicking on the "Posting Words" tab at the top of the page. Before Primary starts put all the picture/song titles pages on the chalkboard using magnets. Have the song titles facing out and the pictures hidden. Tell the kids you are going to read them a Thanksgiving story and that each of the pictures of the book are on the chalk board under a song. They have to figure out which song corresponds to the correct picture. 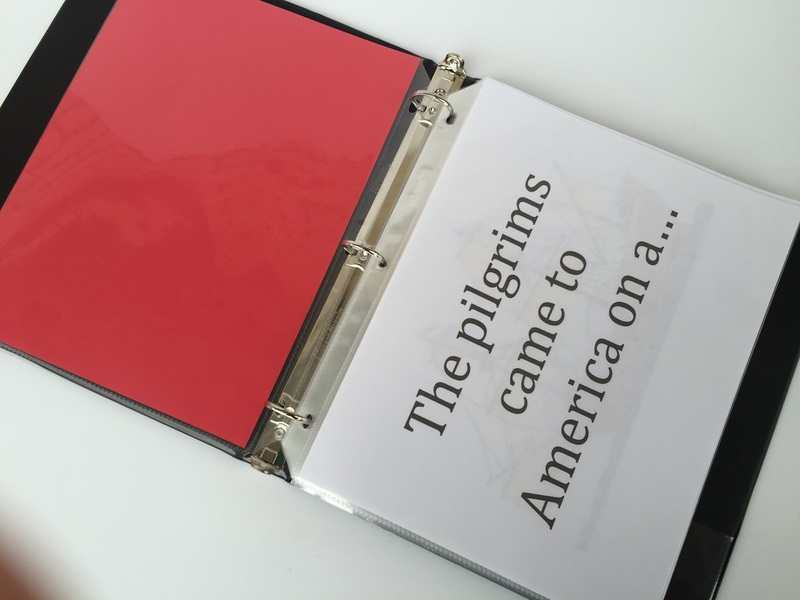 So, for instance, read to them the first page "The pilgrims came to American on..." Then go over to the chalkboard and decide on a song that would answer that phrase. 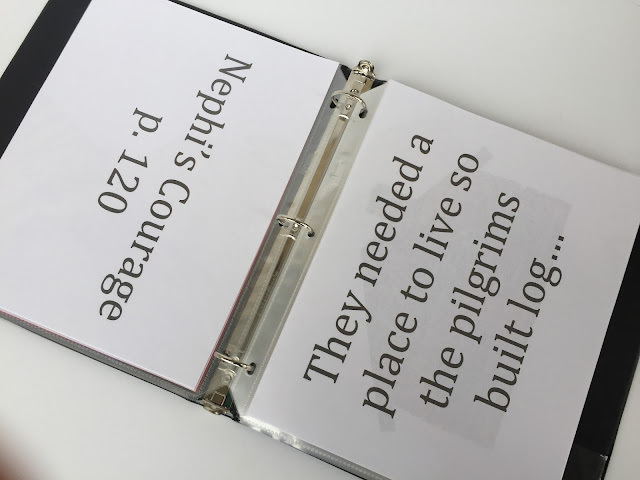 The answer would be Nephi's Courage (because who else traveled on a boat?). 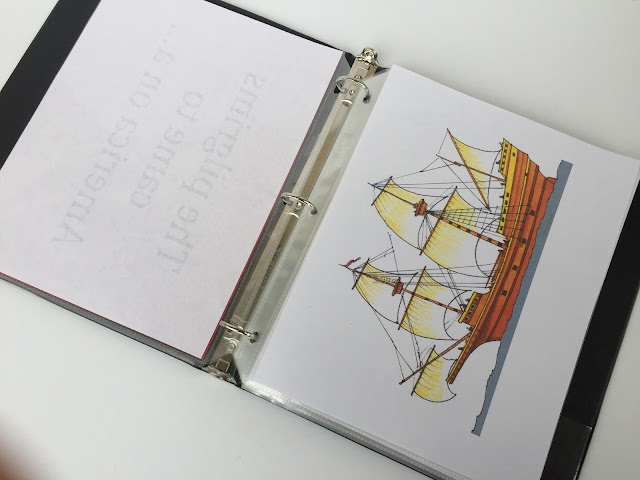 Sing Nephi's Courage (we'll probably only sing the 2nd verse that talks about the boat) and then remove the page to reveal the boat (Mayflower). Remove the picture from the board and put it into your story book. Continue on until all the pictures are removed, the songs are sung and your story book is put together in order. If you have time, read the completed book with all the pictures. For Junior Primary, I may or may not use the Sr. activity. If I don't, I'll just read the book (it will be all put together) and we'll sing the corresponding song to each picture. Or, I'll post the pictures on the board with the pictures facing out and the song on the back, that way they can just pick the correct picture to place into the book. Thank you SOOO MUCH for this most excellent post! You saved me from giving a boring singing time. Because of time constraints, I taped the pages to the chalkboard, just told the story and we sang the songs in order. I was going to flip the pictures over so only the song titles showed and then mix them up for senior primary, but when you only have 15 minutes.... It worked well anyway, and the sharing time lesson was worth it. Thank you both for your nice comments! Glad it worked out. It turned out to be fun with my Primary, definitely will be using it again. I used this idea today, and it was a hit! Thank you for the great idea, and all your hard work! I love your blog!! Just to update: this was GREAT! I read it in Jr.and did the activity in Sr. and it was a success both times. 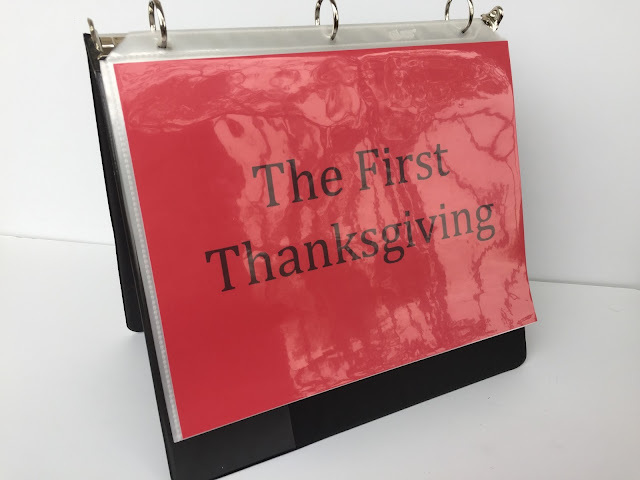 I think putting the sheets in a binder worked well for us because I was able to stand the binder up on edge and use it as a flip book, basically. 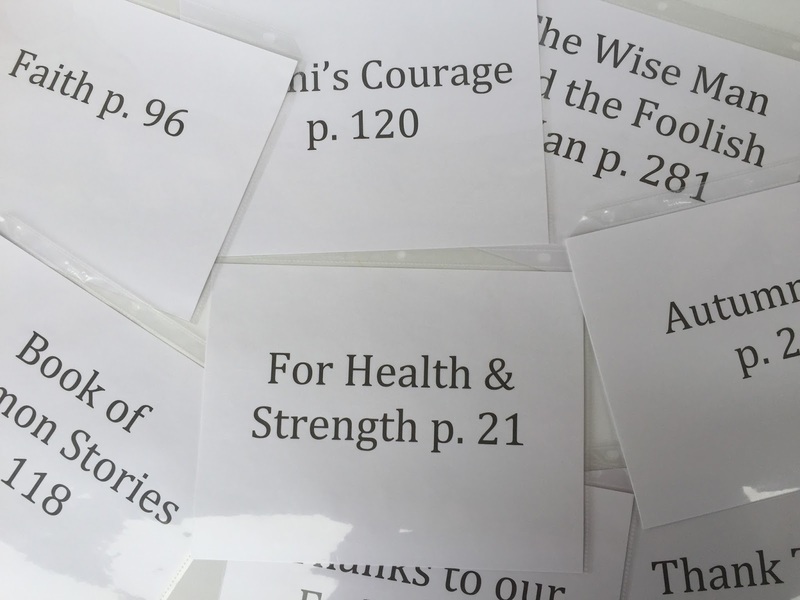 The kids in Sr. enjoyed putting the pages in. Thank you so very much!!!!!!!!!!!!! I think you are right about a binder. I'm going to probably do that next year. The rings were a little bit of a hassle. Thanks for the tip! Let me reiterate how awesome this was! I have decided to go ahead and make a Christmas Story completely based on this idea! Thanks so much! Such a great idea!!! Thanks for always having such fun, cute ideas! Can't tell you how many times you have saved me! I did this today. The primary thought it was great! Especially the senior kids who learn songs like lightning. Thanks for all your hard work. Thank you so much! I shared this with my Primary yesterday and it was AWESOME!! I used the picture side for Jr. Primary and the Song side for Sr. Primary. The kids were so engaged! I am so grateful for your site!! Thank you so much for all you do to help other primary music leaders. You are a lifesaver! I am so grateful for you and very appreciative of this activity. Can't wait to try it out tomorrow! Wonderful! Thank you so much for this great and convenient idea! So do you primary kids know all these songs? How do you do this activity if they don't know them all? Do you sing a solo? I post the words to all the songs. If I'm really concerned, sometimes I'll bring the song in on CD so the kids can sing along as well as read the words. If you check out my "Posting Words" tab at the top of the page, that will have more information. Hope that helps. Do you anticipate having time to sing all verses to these songs, or do you stick to one verse? I'm SO bad at estimating how much time singing songs will take up! I usually don't sing all the verses. For Nephi's Courage we'll just do the one about building the boat, we'll sing everything for The Wise Man and the Foolish Man, only the 1st verse for Faith, the 1st and 2nd verses for Book of Mormon Stories and for the 2 short songs at the end, we'll sing all the verses as the other verses pertain to the items in the book. Hope that helps! If you find you have extra time at the end, go back and sing all the verses to everything. I tried this activity last week, and the kids loved it! We followed your lesson plan pretty much as you have it outlined, I just added activities for three of the songs. For Autumn Day I brought several apples, since the song mentions them, and a child from each class came to the front and tried to balance one on their head while we sang the entire song. If their apple fell off they just picked it up and put it back on, and we didn't bother keeping track of who won. For Give Said the Little Stream I used the blue scarves you suggested for teaching this song in Nursery, and the Sunbeam class came up and waved them like water. For the Sr. group, I had one child from each class come up and try to juggle 2-3 of the scarves while we sang the song. And for The Prophet Said to Plant a Garden, I brought a toy from when my daughter was a toddler--wooden fruits and vegetables that are in 3-4 pieces and held together with velcro, and a wooden knife to chop them apart with. One child tried to chop up all the fruits/vegetables while we sang the song, while another child tried to put them all put back together as fast as they could. We sang through each of the songs once before I let them try the activities because I thought they'd get very distracted, but the kids were great and participated really well. Thank you SO much for sharing. Your lesson plans save me!